Does managing money, bank accounts, investments, and/or debt payments ever make you feel overwhelmed? It doesn't have to! These simple finance tips inspire you to pare down to the absolute basics. 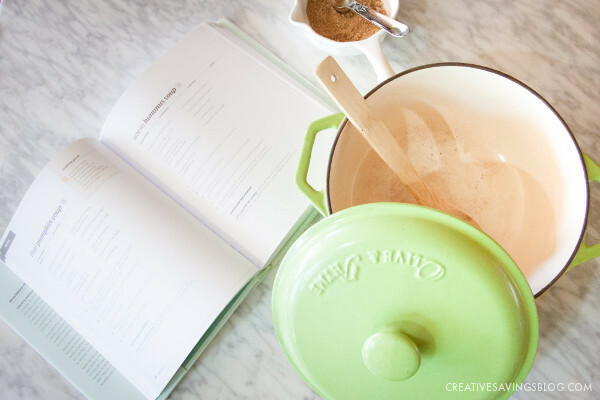 I am so SO excited to have Rosemarie from The Busy Budgeter on the blog today! Rosemarie is a genius when it comes to managing her money, but what I love most about her is she doesn't just talk about what to do, she shares how to implement each of her strategies step-by-step. I can't wait for you to learn all the incredible takeaways she shares in this post. I know you'll be just as inspired as I am! Sometimes dealing with your finances can seem, well…overwhelming at best. There’s dealing with debt, figuring out who you owe money to and how much, wondering how to start saving, plus dealing with unexpected “life” that happens. (Oh, the furnace stopped working? The car needs new tires? Awesome.) Figuring out finances can feel like a complicated nightmare. I’m here to tell you, moving from paying off over $40,000 in debt to growing my business, finding a way to afford everything that comes along with our two kiddos, and now helping my husband build his dream business…If I can do it, you can totally get your finances figured out. It can happen. Will it happen overnight? No. Will there be some sleepless nights when you feel defeated, overwhelmed and just plain frustrated? Yep. But you’re going to make it through. WE’RE going to make it through. There’s no time like today to start. Take baby steps and just bite off what you can chew. Set small goals and watch your progress. You’re not alone! Tons of people struggle with debt and getting a handle on their finances. 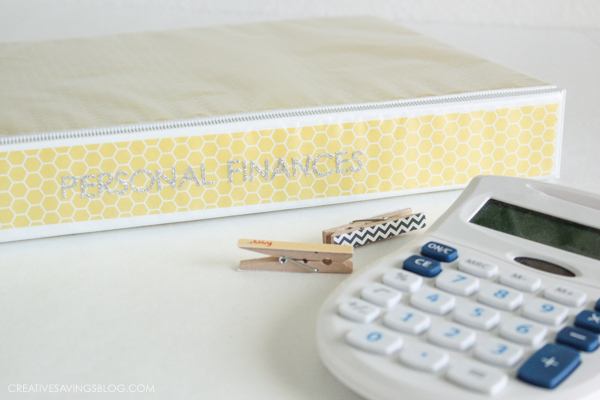 For me, personally, the trick to tackling my finances was setting up my budget. I was NOT one of those people with amazing accounting skills. When I started, I literally had no idea how to make or follow a budget. Once we got going though, it worked. Through trial and error, we figured out what helped and what “tips” and ideas we could toss, and eventually it became easier and easier. One of my biggest tips? Simplify: Keep It Simple. Finances can be complicated, especially if you have different revenue streams, various debts, and even inheritance, investments and other positive financial items. Simplifying it and wrapping your head around where you stand with money is really important. When I was at the end of my rope with debt and financial disorganization, a huge part of the problem was how disorganized the rest of my life was. My dishes were piled up. My laundry was in heaps throughout the house. Bills and paperwork got lost and tossed aside. It wasn’t just about lacking financial skills—I was totally lacking basic life skills. I’m not saying washing your dishes is going to directly get you out of debt (wouldn’t that be nice? ), but it will help you feel more in control of your life. Few people understand the way that organization, home routines and budgeting are intertwined. Somehow, when your house is organized, you magically feel like you have a better handle on your life. When the kitchen is clean, you can fix meals and plan ahead for the week. You won’t be running to the store at the last minute, blowing your grocery budget, or saying, “forget it” and going out to eat. You’ll have food ready for lunches. You’ll be able to find the items you need on hand. You’ll have clean clothes to wear, and I guarantee that will make you feel more confident and put together. You won’t be so frazzled. Pick a task you want to get started on. For me, laundry was a big mountain to tackle. However, once I created a simple routine and stuck to it, it became a non-issue. It was pretty amazing, actually. Having laundry hanging over my head all the time made me feel overwhelmed, behind, and like I was always avoiding something. Once it was off the table, everything else started to fall into place. Getting behind on dirty dishes was another make-or-break item for me, so once I got it under control, my life started to go much more smoothly. It’s important to establish routines in your home to support your efforts to save money. Not only will it ease your stress, it’ll keep you from spending money to resolve problems caused by being disorganized. When debt or overdue bills become stressful, we all have a tendency to make like an ostrich and bury our heads, hoping it will go away. Believe me, I know what it’s like to set bills aside, unopened, because you just don’t want to see what’s in them! It’s time to figure out as much as you can about where you stand. It’s the first step to getting a handle on everything. Take a deep breath. You can do this. Gather your bills, your bank statements, the login information for any accounts you have, and your monthly utilities. You’re going to start by simply writing everything out—not the details, just the simple totals. Write down what you make per month and what you owe. Open up those bills and take a look. I know it might be scary or hard, but it’s something you have to do to move forward. It’s going to be okay. You’re taking steps to move things in a positive direction and that’s what’s most important! 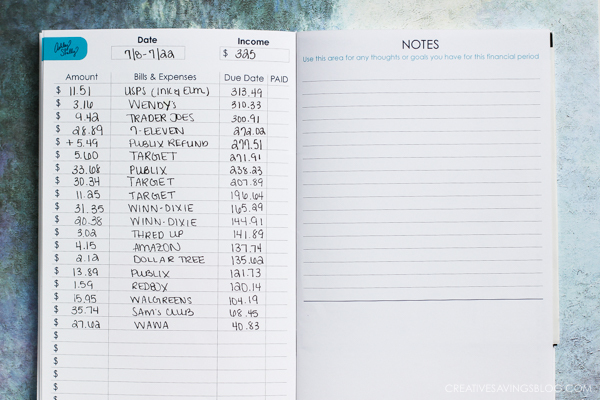 Once you get everything together and written down, it’s time to start putting together a budget. If you’ve never put together a budget before, it’s a great time to go through the steps in the Creative Savings Beginner’s Guide to Budgeting. This guide literally walks you through every single move you need to make to get yourself on a budget and moving forward. Having a budget gives you a launch pad for everything else. Once you’ve established your budget, you’ve got a guidebook for what you need to do next. As part of your budgeting, you’re going to want to find a money management system that works for you. If you’re already using a budget tracker (like YNAB, Mint, Every Dollar, or Calendar Budget), then you’re already a step ahead. For everyone else, there are many methods to choose from (learn more about 7 budgeting systems you need to try here!). This might mean using different envelopes to manage cash or it might mean setting up an account tracker and avoiding cash all together. The important part is to find something that works for you in a realistic, manageable way. Will you stick to it 100%? Probably not, and that’s okay. The goal isn’t perfection, but progress. Even if you slip up, you need to have some wiggle room in your budget and space to account for it. It’s easy to say, “Oh my gosh, we HAVE to swear off spending forever, NOW!”—but that’s not very realistic. Even if you can manage to cancel your cards, hide your cash, and never step foot in a store, you’ll eventually find yourself facing a want or a need you’d like to fulfill. Make room for it in your budget so you don’t go off the rails. Be realistic. That said, there might be times when you have to quickly increase your bottom line. For example, a job loss, illness or major unexpected expense. When this happens, don’t panic and run to get a payday loan or swipe a credit card with a giant interest rate and undo your progress. Instead, take a hard look at areas you can cut back on. Quitting your gym membership, swearing off Starbucks, and eating at home. Going on a spending freeze. Cancelling cable or cutting back your cellphone plan. Finding items to sell on eBay, Craigslist or elsewhere. Picking up a side job. There are many ways to stretch your bottom line and make extra money quickly and fairly painlessly, but it does require some work. Be realistic about your money management and find a way to control your spending and bring in some extra dough when you need it. 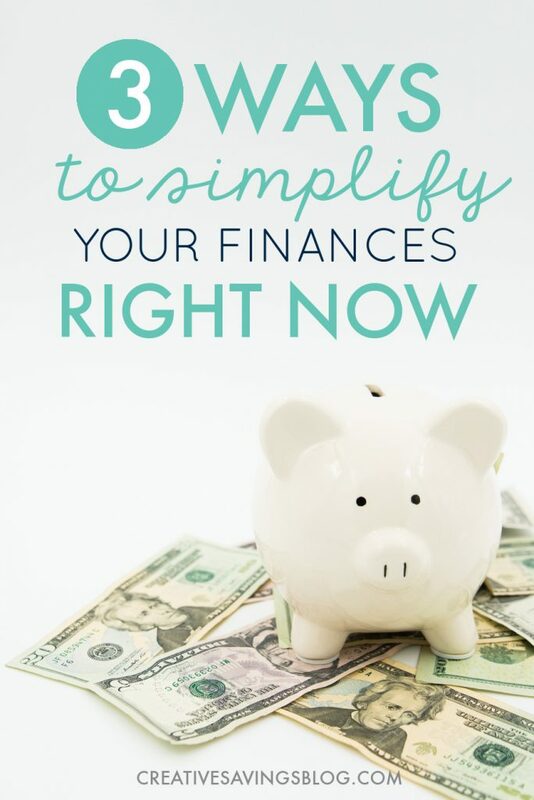 Money can be complicated and finances can seem overwhelming. Take small steps to make progress and reward yourself as you go. While it might not mean you get to go to Disney World every time you do a load of laundry or divide your cash into envelopes, you should still take a few minutes at each step to pat yourself on the back. After all, every journey begins with a step in the right direction. By simply getting started on your budget, finding a way to manage money better, and getting your life organized, you’re making leaps and bounds over everyone who hasn’t started yet! You can do this. Take the first steps and get started! 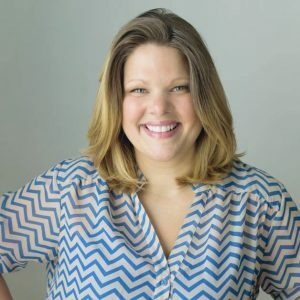 Rosemarie Groner is a formerly stressed, overworked and exhausted mom who loves blogging almost as much as she loves brownies. She writes at The Busy Budgeter about how she used the free Ultimate Money Saving Workbook to reduce their spending enough to be able to quit her job, stay home with her kids and then found ways to make up her salary at home. She’s still working on the cure for exhaustion. Absolutely! There’s no use setting up guidelines for spending if you don’t keep track of it after the fact. I am a huge fan of Rosemarie and her advice is always spot on! I’ve decided that 2017 is going to be “my year”–the year to finally pay off debt, learn Spanish, and get my home organized and decorated the way I want it. Getting some great systems in place is going to be a huge step towards all my goals! That’s awesome, Sandie. 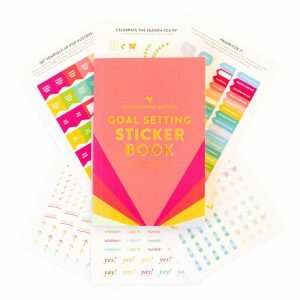 Anytime you’re feeling overwhelmed just remember to break your goals down into small, easy to complete, tasks! I’m cheering for you. I think finding a money management system that works for you is SO important. I do this through Mint and Personal Capital. Now, it’s automated and my focus is on making more money from my blog to repay my student loan debt. I love it! I simplified my finances by focusing on using a single credit card rather than multiple cards. It much simpler and I can track my payments, expenses in much better way. I agree with eliminating any services or subscriptions which you hardly use, you can reduce that payment from your budget. Finding the system that works best for you is key! Some like having specific cards for specific spending areas, and it works for them. But there is something to be said for having the simplicity of just one single card. Glad you found the system that works for you, because that is what is most important! Thanks Rosemarie.I have read so many posts on this but never found an answer like this.After having kids,Saving(specially in a country like Sri Lanka) for future have become a must and proper guidance for this is a need.What I do is save every cent I receive in a bank account and withdraw when needed but that works only for a certain extent.Thanks once again for giving valuable advice regarding this matter.